More than 350 artists will open their studios to the public for Gowanus Open Studios, Oct. 14-16, 2016. 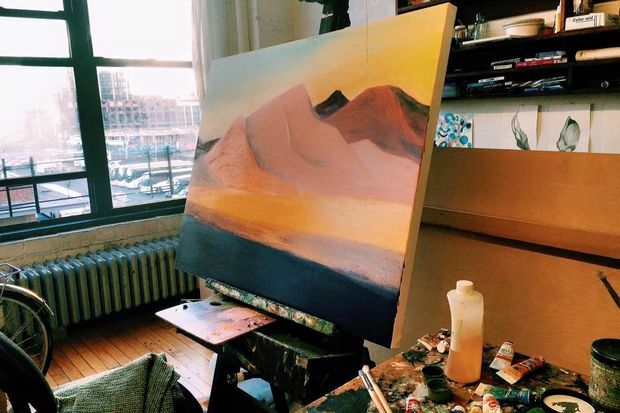 GOWANUS — Though hundreds of artists have lost workspaces in the neighborhood, a record number will participate in Gowanus Open Studios this weekend, organizers said. More than 330 artists will give the public a peek inside their studios during the free self-guided art-a-thon Oct. 14 through Oct. 16, said Abby Subak, director of the nonprofit Arts Gowanus, which runs the event. About 5,000 people are expected to attend this year's 20th anniversary event. "I guarantee every visitor will find something they're really inspired by or will enjoy the quality of," Subak said. "The art is amazing." This year's open studios comes as nearly 500 artists and musicians have been booted out of a sprawling complex of studios on Ninth Street and Second Avenue, Subak said. "Evictions are impacting the morale of artists in the neighborhood and escalating a nervousness that has been there among artists, but it hasn’t impacted our numbers," Subak said of Gowanus Open Studios. "We're still a strong thriving community of artists." Visitors can find open studios by looking for buildings festooned with turquoise balloons, or pick up a printed map at various locations. ► See a full moon flotilla on the polluted Gowanus Canal. Artists and boaters will release a flotilla of small boats from near the Carroll Street bridge at 6:18 p.m. on Saturday, Oct. 15. ► Embrace the awkwardness. Looking at artwork while the artist is standing right there can sometimes be socially awkward, but organizers this year are gently nudging visitors to welcome that weirdness. They've even provided visitors with tips on how to talk to artists about their work. ► Take a walking tour of the neighborhood. Stroll the industrial streets of Gowanus with Local Expeditions on an express tour that leaves you plenty of time to explore artists' studios, or learn about the area's green infrastructure in a tour with the Gowanus Canal Conservancy. ► Explore murders, tragedies and heroes at the "Gowanus Underworld" show. Novelist Amy Sohn and visual artist Christina Kelly collaborated on this multimedia piece that pairs audio monologues inspired by actual news stories with artifacts found near the canal. ► Get your tarot cards read at Gowanus Swim Society's party. This party on Oct. 15 at Halyards bar features live music, video pieces and tarot card readings by "intuitive tarot reader and energy healer" Moriah Simmons.